We’d love your help. Let us know what’s wrong with this preview of History of the Great American Fortunes V1 by Gustavus Myers. In Three Volumes. Vol. I. Part I. Conditions In Settlement And Colonial Times. Part II. The Great Land Fortunes. 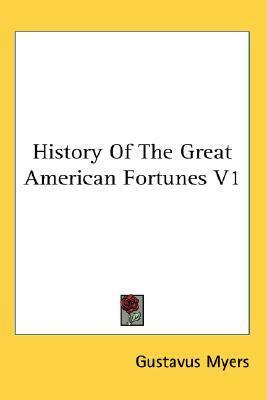 To ask other readers questions about History of the Great American Fortunes V1, please sign up. Fantastic. Gustavus Myers, from the muckraking tradition of the late 19th century, completely demolishes the false hero-worship of the great American capitalists. Myers wants to set the record straight on exactly what kind of lying, cheating, and stealing were necessary to amass the great fortunes of early America. John Jacob Astor especially gets taken to the woodshed for a serious thrashing. Myers begins all the way back in the 16th century with estates gained by both hook and crook - then mov Fantastic. Gustavus Myers, from the muckraking tradition of the late 19th century, completely demolishes the false hero-worship of the great American capitalists. Myers wants to set the record straight on exactly what kind of lying, cheating, and stealing were necessary to amass the great fortunes of early America. John Jacob Astor especially gets taken to the woodshed for a serious thrashing. Myers begins all the way back in the 16th century with estates gained by both hook and crook - then moves through to the beginning of the 20th century. Gustavus Myers (1872–1942) was an American journalist and historian who published a series of influential studies on wealth accumulation. His name is associated with the muckraking era of U.S. literature—somewhat erroneously, since his work is not journalistic, does not aim at popular magazine publication and takes an altogether more scholarly investigative approach to its subjects. In the decade Gustavus Myers (1872–1942) was an American journalist and historian who published a series of influential studies on wealth accumulation. His name is associated with the muckraking era of U.S. literature—somewhat erroneously, since his work is not journalistic, does not aim at popular magazine publication and takes an altogether more scholarly investigative approach to its subjects. In the decade of the 1910s, he emerged as a leading scholar of the American socialist movement when he authored a series of volumes for Charles H. Kerr & Co., the country's largest publisher of Marxist books and pamphlets. Between 1909 and 1914, Myers published three volumes on the history of family wealth in the United States, one volume on the same topic for Canada, and a history of the Supreme Court of the United States. These publications were frequently cited and used in an academic setting for several decades, with Myers' History of the Great American Fortunes revived in a single volume format in 1936. This classic work (History of the Great American Fortunes), by far Myers' most important and influential, details and documents at great length the corruption and criminality underlying the formation and accumulation of the great American fortunes of the 19th century that formed the foundations of the American corporate-financial economy, from Astor and Vanderbilt, Jay Gould and Marshall Field, Stanford and Harriman, to Elkins, Morgan and Hill, Whitney, Rockefeller, Dodge, Havemeyer and numerous others, and displays the permanently devastating effects on the structure of the American economy and the quality of life of the vast majority of Americans and on American society.